If you're reading this, you are probably in the process of pitching investors to raise money for your company. I'm the CEO of a company called Slidebean. I've not only managed to raise funding for our startup, but hundreds of companies have also used our templates to do so. In this article we are going to dig deep into how to create a pitch deck for investors, with special attention to the pitch deck structure. There is a pretty standardized pitch deck outline that most presentations follow, so we'll look at each slide and dig into what content you should include in each one of them. Check out our article pitch deck design guidelines if you are looking for guidance on your design. Remember, the pitch deck is the very first impression at investor might get at your business, and it should look stellar. 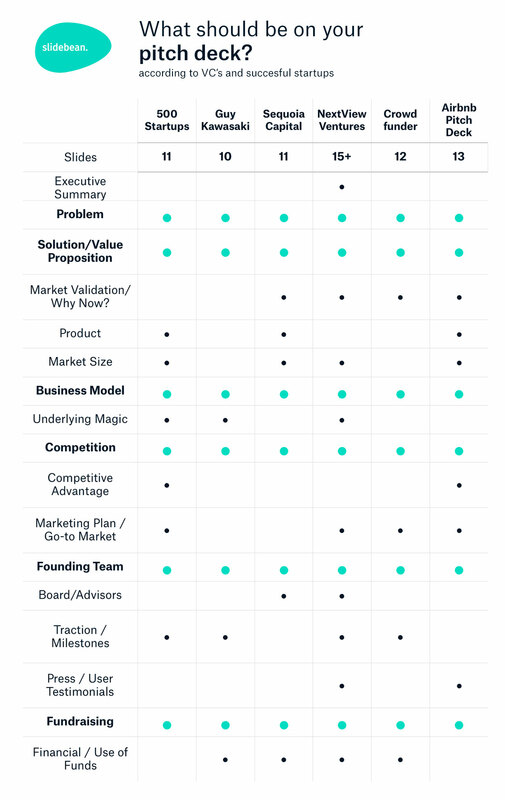 What is a pitch deck outline? Let's not reinvent the wheel here. For anyone wondering what is a pitch deck, dozens of accelerators, venture funds, successful startups and internet personalities have published the 'ideal' contents of an investor deck. We took the liberty of redesigning many of them (you can download them for free on the links below), but the truth is they all have pretty much the same content. 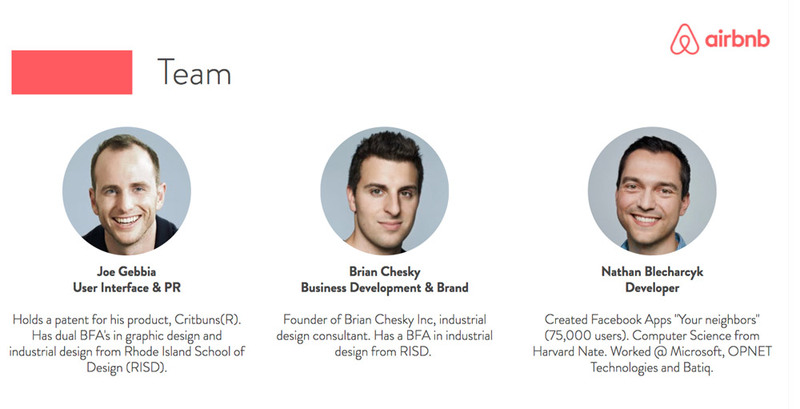 For most of this article, I am going to use the Uber pitch deck as an example. Now the original version doesn't look particularly good, so we'll use Slidebean's redesigned version. This is where you present your case, your problem premise, and your proposed solution. This is a critical part of your pitch because it will determine if you can capture an investors attention for the rest of the presentation. Little to add here on the structure side, we'll look at some design tips later. This is where you present the status quo. 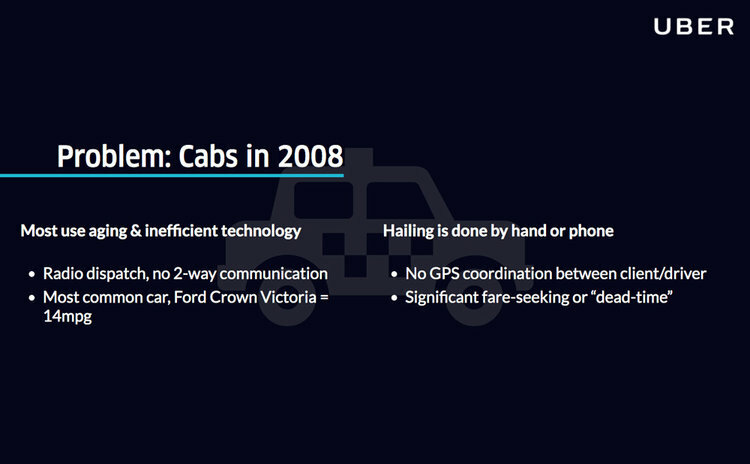 The founders of Uber made it very clear- Cabs in 2008 are far from a great user experience: they use aging, and inefficient technology and hailing is done by hand of phone. This was the reality in 2009, all you had was Craigslist and CouchSurfing, and neither of those was a pleasant user experience. - Price is important for travelers. - There's no way to book a room with a local or to host a spare room or apartment. See how down to earth this problem has been summarized? No complicated jargon, no debatable arguments, 100% straightforward, verifiable claims. Creating empathy with your investors is critical at this point. If you offer a questionable statement, then the whole premise of your pitch will be doubted. If the problem you are trying to solve can be applied to them, great, use that! If you are solving a problem for an entirely different audience, then acknowledge it and again, make sure your premise is solid. The solution is quite obviously you, and your company and your product. Mention three or four core functions of your app and how they address the problems you just talked about. This is a killer line right here: Convenience of a cab in NYC + experience of a professional chauffeur. But in SF and NYC. There's a whole thing about product demos. If you are presenting live, for example, then a product demo is a double edge sword. You risk the demo crashing and ruining your whole pitch, so sticking with a video is safer. If you are sharing the pitch with an investor via email, then a video capture is a nice courtesy and a way to guarantee that the viewer will get a glimpse of your product: you can't assume they'll go to your website, create an account and check it out themselves. Finally, if you are in an in-person meeting, following the flow yourself might be the best choice. Remember, in either case, your video demo should reach an 'aha moment' in 30 seconds or less. if you managed to catch their attention in the first minute or so, now it's time to prove why are you are going to make them reach. Remember, few investors (actually no investors) will give you money because they like you, your team, and your product. They'll do it because they believe your team, led by your vision, can grasp a market opportunity, great a sizeable company and give them a significant return on their investment. This is where you look at how large can this company become. Two ways to tackle it, with what is called a 'bottom up' or a 'top-down' market approach. A Top-Down analysis is calculated by determining the total market, then estimating your share of that market. A typical top-down analysis might go something like this: "Hmm... I will sell rubber duck everyone can use, and since there are 500,000 people in my area, even if I only manage to land 5 percent of that market I'll make 25,000 sales." A bottom-up analysis is calculated by estimating potential sales to determine a total sales figure. A bottom-up study evaluates where products can be sold, the sales of comparable products, and the slice of current sales you can carve out. While it takes a lot more effort, the result is usually much more accurate. There's a great INC.com article you can look into for more details. So going back to our example, Uber planned to start as a NYC + SF service, which makes almost $1.3 Billion per year. 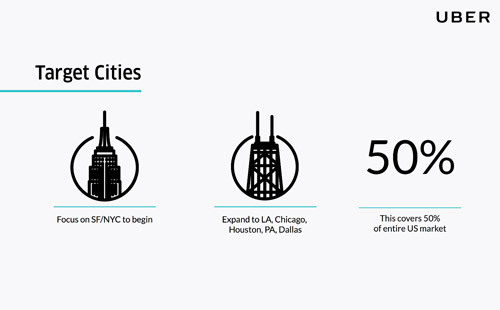 Then they planned to expand to LA, Chicago, Houston, PA, and Dallas, which make up 50% of the US taxi market. 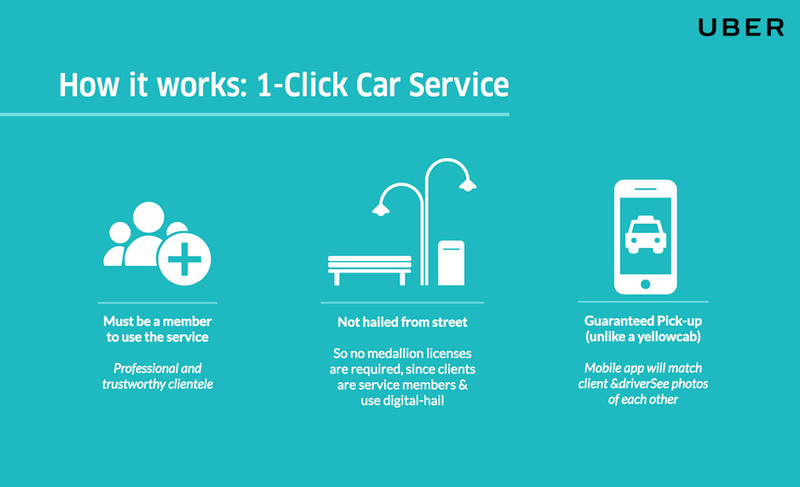 A Worst-Case Scenario where they remain a ten car, 100 client service in SF. 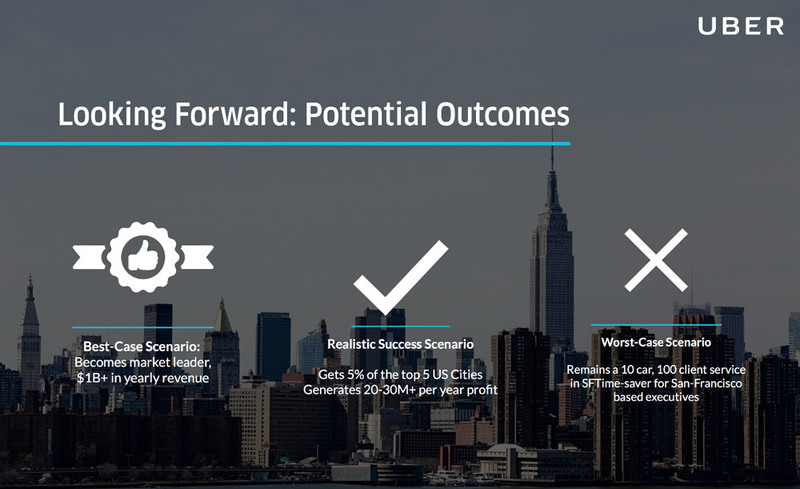 A Realistic Success Scenario where UBer gets 5% of the top 5 US Cities, which represents 20-30M+ per year profit. And a Best-Case Scenario, where Uber became a market leader, $1B+ in yearly revenue. Who would've guessed even that prediction fell short of the company they'd become. Now, the pitch deck business model slide is, in most cases, a slide that makes or break your pitch. 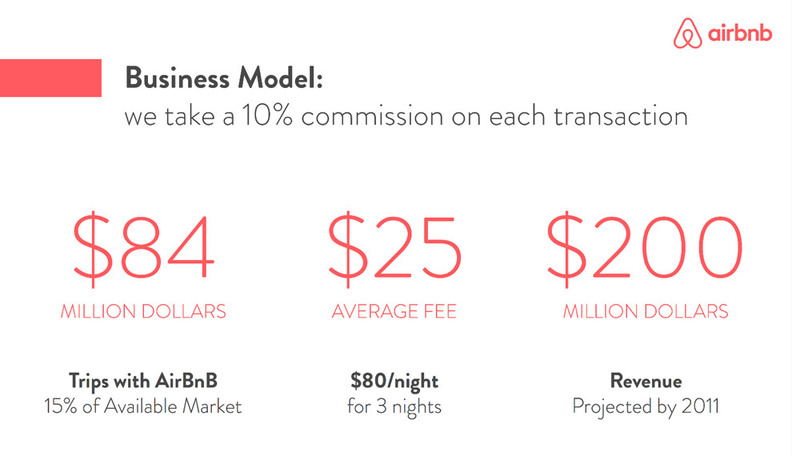 I'm taking Airbnb's example here, whose business model is dead simple: they make a 10% commission on each transaction. That's it. 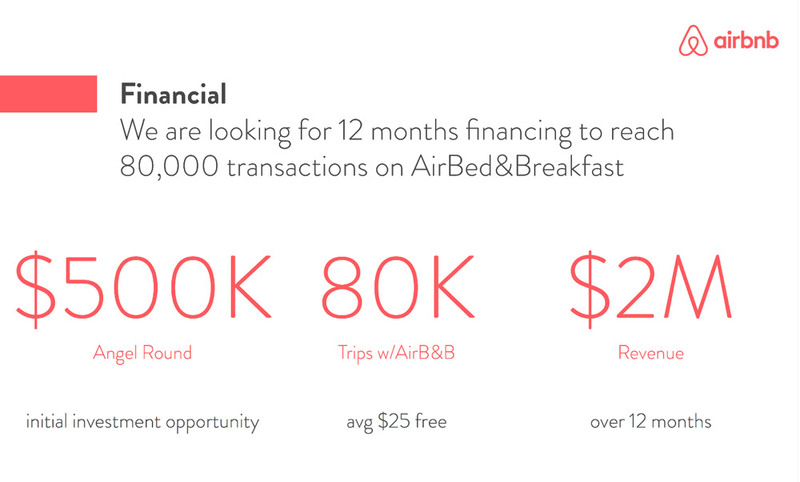 Airbnb makes money in many other ways these days, but the premise remains, there's a percentage of each transaction, and when dealing with a $500MM serviceable market (Budget + Online Trips), even a small portion of the equation yields fantastic economics. 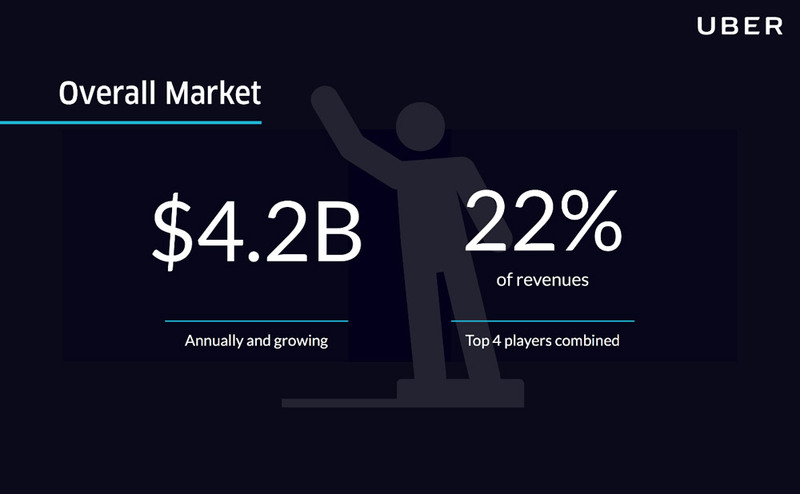 The founders elaborated by making a rough estimate that serving 15% of the addressable market would yield them $200MM of revenue in the first three years. A bold, but eventually accurate prediction. We are working on a new video dedicated exclusively to studying and understanding powerful Business Model slides (We'll be updating this post with the link any time soon). I'm going to use the Slidebean example for the competition slide. 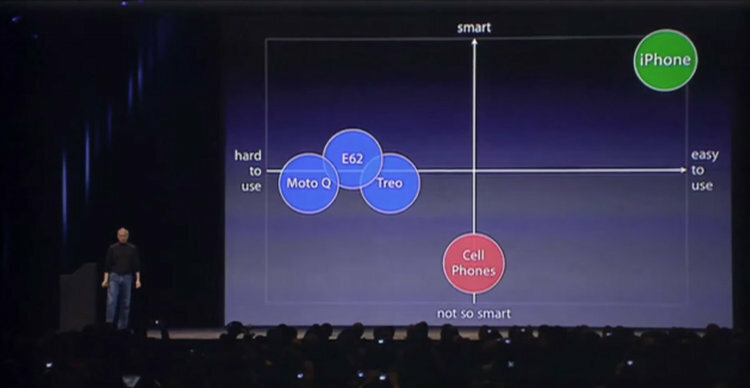 This grid approach to comparing your company to your competitors was popularly used by Steve Jobs when he used to compare the iPhone to any other phone available at the time. If you have a product that stands far apart from your competitors, then this might be the best way to make sure everyone understands the premise. 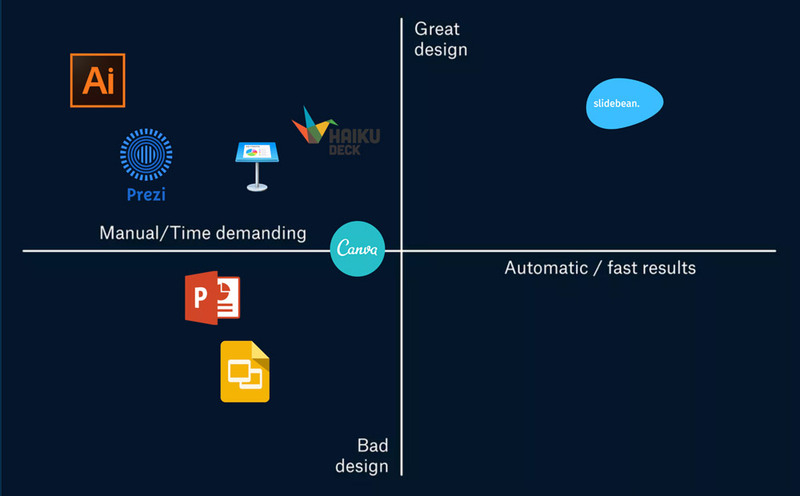 In our case, the horizontal axis would be represented by 'time required to make a presentation or pitch deck,' and 'quality of design' on the vertical axis. Traditional presentation software like PowerPoint would have an average design quality, with terrible efficiency. Prezi, for example, provides somewhat better results, at the cost of even more time. All the way to the extreme, you can create a top of the line presentation using Adobe Illustrator, but this is a professional tool for designers. Slidebean's niche is right here, where high quality meets efficiency- and with this diagram is easy to see how it stands apart. The Underlying Magic slide also referred to as the Competitive Advantage slide, is where you elaborate on the technologies and patents you've developed to make your product or service unique. Feel free to get more technical here. 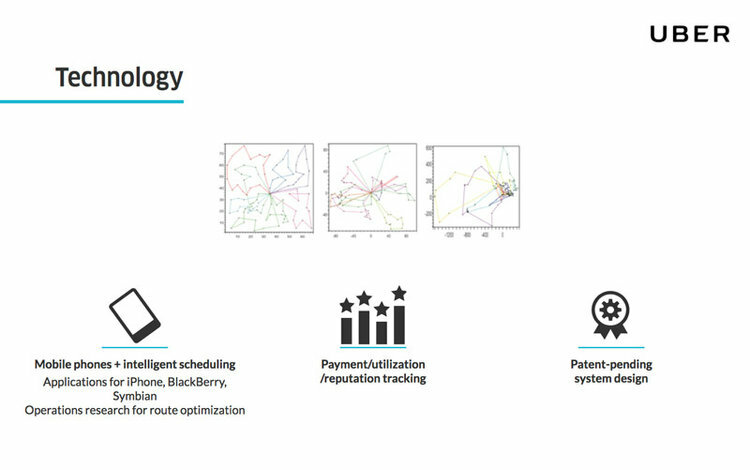 Going back to Uber, this is where they get to brag about their route optimization system, reputation tracking, and demand forecasting: that's right, surges. As much as we users hate them, that is one of Uber's most powerful innovations. The go-to-market slide should refer to your plans to acquire a mass audience. Now the reality of any startup is that there is no way to know how these 'plans' will work until you try them out, and you'll likely need to update this slide regularly as you try and fail with different marketing tactics. It's essential, however, to remember and fake it till' you make it: always have a plan and pitch it as if you are 100% sure that's the way to go. The point of this slide is proving that you can figure out ways to grow your business, both with a large pool of ideas and the ability to execute. 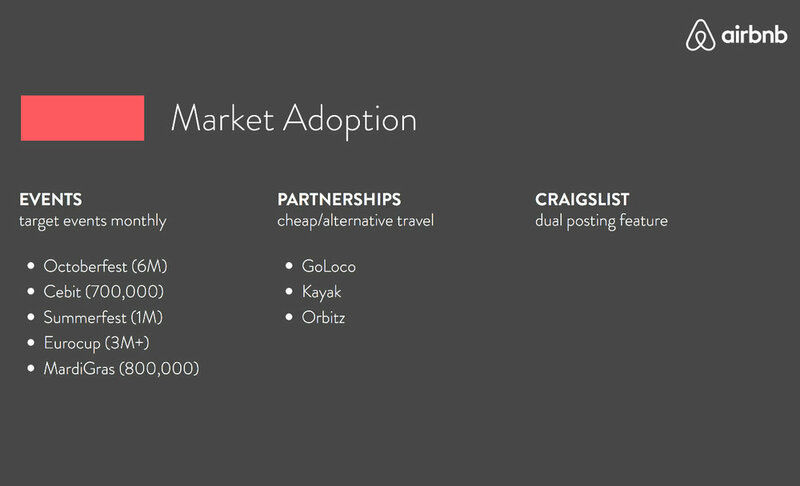 Airbnb's slide refers to three alternatives: events, partnerships, and the 'dual posting feature.' In the end, they never managed to make a deal with Kayak, but they hit the nail on the head with the dual posting function. In a nutshell, they developed a bot that would take any Airbnb listing, repost it on Craigslist and link back to the original Airbnb post, thus increasing their traffic and awareness, as well as the chances of getting a listing booked when they had few customers. Almost done now, moving up to the team. This slide should be simple: mention your founders and why are you the right people to grow this company. Remember the ideal founder combination is the hustler/hacker/hipster trio. 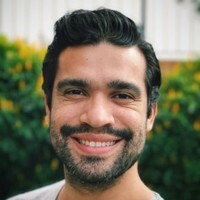 A hustler, usually the CEO that can sell the company and keep investors excited around it; a hacker, often the CTO that can lead the product development for the first few years; and finally a hipster that can build a brand both through high-quality design and marketing. Do not talk about your advisors, first employees or anyone who is not dedicated 100% to the company. The Traction/Milestone slide is another crucial piece of your pitch. Actually, if you are pitching in front of an audience in a demo-day type of event, this slide should probably go first, right after your cover; this gives you credibility early on and captures people's attention for the rest of the pitch. In the storytelling arch of your presentation (click below to see our video on Storytelling) the Traction is the lethal blow and the climax of your story. 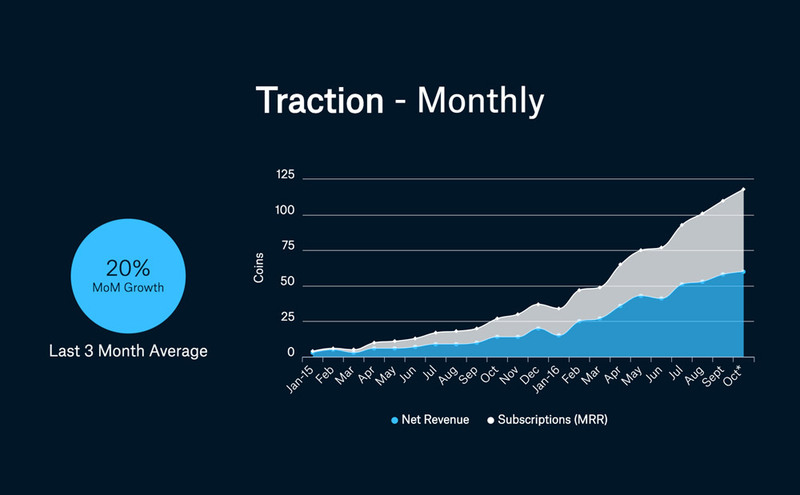 If you have revenue, and it's growing, that should be the only chart on this slide. If you don't have any sales, you might want to reconsider pitching investors, as it's tough to raise money without income. If you must, then talk about user growth, monthly and weekly active users. 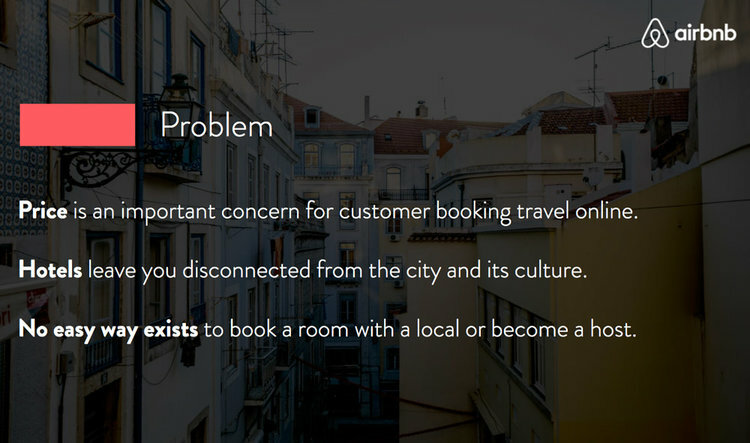 Both of the pitch deck templates we are referencing, Uber and Airbnb, have a final fundraising slide with their ask. In the US, the SEC has certain regulations as to whom can you show your financial data, so you should be careful when sending your deck to people who aren't accredited investors. - If you are pitching on stage, to an audience, do not add this slide. - If you are sending this deck privately to a VC, then you are probably OK. When in doubt, check out this article for more info. So all of the pitch deck templates we talked about are available to use on Slidebean. Creating an account is free, and you can start editing right away. 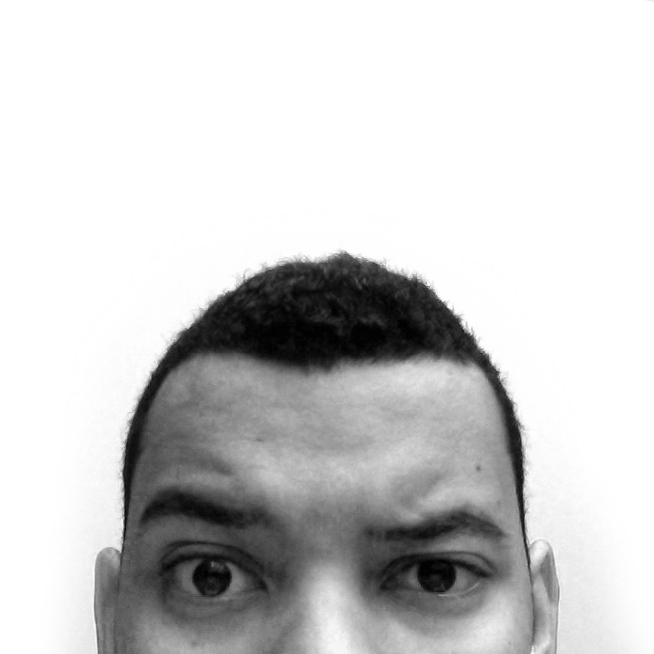 Slidebean's algorithm will handle the design for you, so all you need to care about is the design. If you want to do this in PowerPoint or your platform of choice, well shame on you, but check out our next video with some Pitch Deck Design guidelines.